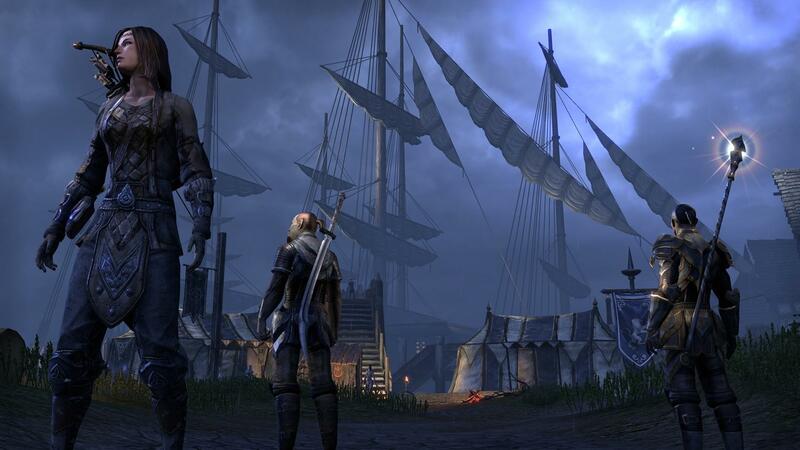 The Elder Scrolls Online: All the obsessive fun of ‘Skyrim,’ but now with friends! 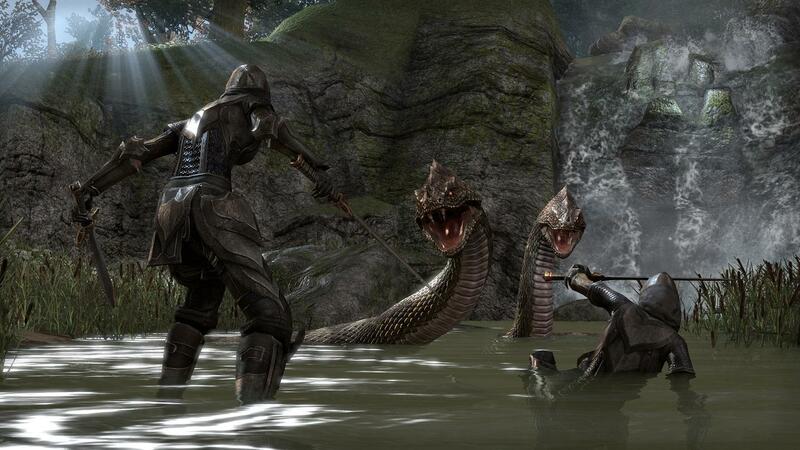 Check out our review of The Elder Scrolls Online. Despite Skyrim’s incredibly sophisticated digital world, it can be a lonely place. There are only so many times that you can lure a companion or a random NPC directly into the path of a giant and watch as they are punted into orbit before you begin to wonder how much more fun it would be if you could do that with – or to – a friend. Some moments in Skyrim only work as a single player campaign of course, like when you unwittingly eat human flesh or accidentally stab your NPC companion in the back of the head 63 times before they turn on you, but the appeal of adding real players to that world is undeniable. In fact, there may never have been a property that evolved so naturally to fit into an MMO universe as The Elder Scrolls. At a recent playable demo of The Elder Scrolls Online, we were given a chance to play through an early section with a character at level six. Being level six means that charging a beast powerful enough to imprison a god and fearsome enough to make the world cry is an unwise decision. It’s powerful enough to get a sense of the gameplay, but only as a slight taste of the potential addiction. The problem with playing early builds of MMOs is that you are just seeing the outline of the game. It’s a bit like seeing an unfurnished, unpainted house with unfinished floors. The real game won’t begin until the mega-server (the game will use one “mega-server” rather than shards) is populated. The demo showed only a fraction of a world that features massive areas and different sections for things like PvP, but it was enough to get an idea of the direction it’s headed in. Once More into the World of Nirn: The Elder Scrolls Online takes place in the familiar world of Nirn, on the same “mortal plane” used in all the Elder Scrolls games. It takes place 1000 years before the events of Skyrim and 800 years prior to Morrowind and Oblivion, so locations will be familiar, but radically altered. You may wander into Winterhold just as you would in Skyrim, but a thousand years will separate the two versions of the city. Your Mission(s): As with most MMOs, you have several choices at the beginning of the game while creating your character, and these will help to determine many of your abilities. It’s at this point that you aly yourself with one of the three factions fighting over the the continent of Tamriel: The Aldmeri Domionion, The Dagerfall Covenant, and the Ebonhart Pact. Each faction contains specific races, so your allegiance also determines your initial character build. The aesthetic options are significant as well, and you can tailor your player to look almost any way you want (provided you have incredible patience). After that you are released into the wild, where you are quickly swept up in the events of the area you begin in. Like all Elder Scrolls games, there will be plenty of side quests, many of which will be major story arcs in their own right. You can load up on quests, then pick and choose the ones you want. The main objective, however, is to defeat the Daedric Prince Molag Bal. And that will require time and improved skills. Team up, Choose a Direction: Joining friends is easy, and you can join anyone, anywhere (although you might regret it if you aren’t properly leveled). Each quest is unique to the individual. So while you can’t progress in the story with friends, if you are in a group everyone shares experience. The character level cap is currently at level 50, and ZeniMax estimates that it will take around 150 hours to reach it. The game is very much skill progression based though, meaning that if you hit level 50 but never once used a bow, you will start at zero on that weapon and need to put in time, much like Skyrim. Click, click, boom: The gameplay is more of a traditional MMO than Skyrim’s first- or third-person combat, but it won’t be completely foreign to fans of that game. The setup is similar to Diablo and countless others, with you clicking on the mouse buttons to attack before unleashing a cooldown-limited magic or power move by using one of five designated keys. Whack, loot, repeat. The enemies are similarly inspired by traditional MMO rules. Their diminishing health bars tell you how much damage you are doing, but their attacks tend to follow very simple patterns of punching you in the face, or lobbing magic attacks from a distance. The Undiscovered Country: The game takes place on the continent of Tamriel, with different sections representing different play types. ZeniMax Online isn’t quite ready to unveil everything here yet, but one area, for example, will be Cyrodiil, the setting used in The Elder Scrolls IV: Oblivion. The story casts this area as a warring kingdom in which the people turned to black magic to survive. That’s the setup for this section of the world being PvP. Some regions will be blocked off initially, but expansions are already being planned. At launch, the game will be big enough to incorporate the lands seen in Morrowind, Oblivion, and Skyrim, plus more. The scale is different, so it won’t take you as long to run across this Skyrim as it did in The Elder Scrolls V, but the sense of scale is incredible. Work in Progress: The beta on display represents a mostly completed game, with some obvious fine tuning still to go. However, the graphics and the look of the game represent a fairly accurate portrayal of what Elder Scrolls Online will look like on release. The audio is still incomplete, but that isn’t surprising. The quality of the visuals will of course depend on the power of your PC/Mac, of course, but the game looks like an MMO rather than a single-player first-person RPG like Skyrim. The land is varied, but it also repeats itself, and the level of detail is good, but not on the same level as the previous Elder Scrolls games – at least not in what was shown. That isn’t isn’t surprising for a game of this scale though. As far as MMOs go, it’s on par, and perhaps better than most. The Elder Scrolls Online may not look or play exactly like Skyrim, but it carries over all the same addictive qualities that made the 2011 release so loved by gamers (and reviled by their spouses/friends/roommates/etc). The amount of work and time already spent to build this world over the years in previous games is a major boon, as the land comes equipped with its own rich history, mythology, and even legends. Longtime fans should love that, while casual and new fans get a sense of the depth. The Elder Scrolls Online enters a competitive and changing field, and it still has a lot of questions to answer – starting with whether or not there is a subscription fee – but few properties have ever been as ripe for reimagining as an MMO. It has all the tools in place to win over genre fans, while possibly creating new ones as well.